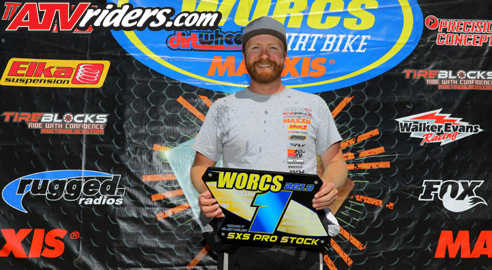 Tempe, AZ (9/20/2018) - Pro Motorsports’ Matt Hancock dominated the WORCS Pro Stock SXS race at Glen Helen Raceway, turning in his first victory of the season. Hancock was driving a Polaris RZR in the six-lap event. Hancock snagged the holeshot at the beginning of the race and immediately began putting down fast laps. After negotiating lapped traffic for the last three laps, he came home with the wire-to-wire victory. Hancock claimed yet another holeshot on his Maxxis Big Horn 2.0 tires and clutching by Sparks Performance Products. The 28” tires, combined with Elka shocks helped him easily negotiate the muddy and hard-packed surface. The conditions caused quite a few cars to retire early with mechanical issues. Hancock was especially proud of the way his RCV Performance axles held up. The victory came at the perfect time for Hancock as it places him third in points, still well within range of the title. Hancock is now 23 points behind the leader heading into the final three races. Hancock will return to the WORCS Series when it visits Mesquite MX in Nevada October 5-7. 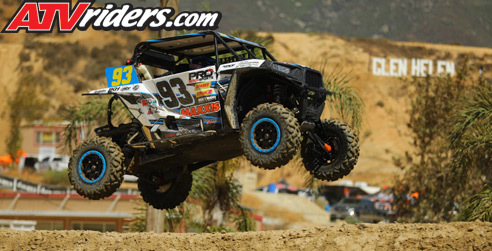 Maxxis Tires, Pro Motorsports, LKH Farming, Elka Suspension, Tireblocks, Polaris, ROLL Design, SPARKS Performance, FLY Racing, K&N Filters, Method Wheels, Polaris Lubricants, Odyssey Battery, ATVRiders.com, Finish Line Signs, VisionX lights, RCV Axles, DragonFire Racing, Butter Supply Co.